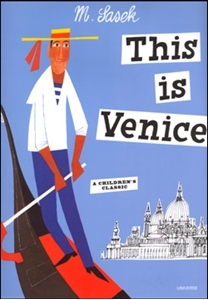 In This is Venice, M. Sasek goes gondolier as he captures the delicate shades, gaiety, and rare romantic charm that is Venice. Wedded to the water with its gondola traffic and buildings pink and gold in reflected light from water streets, Venice is a city unique - a city beautiful. Here, under a Venice blue sky, are the Rialto Bridge, the Palazzo Grassi, the Piazza San Marco with the Basilica of St. Mark, The Doges’ Palace, the Accademia di Belle Arti. ‘Abandon wheels, all ye who enter here’ - This is Venice!